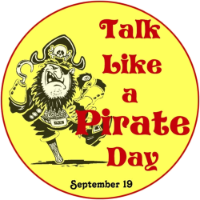 In honor of Talk Like A Pirate Day (which is today, in case you didn’t know) we go backinto the Radio Free Charleston Archives for a couple of video clips featuring our friends from California who happen to be real, true pirates, The Dread Crew of Oddwood. Five years be past since the ARRRRR-F-C cameras caught up with the plundering pundits of “Heavy Mahogany,” and the scurvy dogs are still kickin’ and playing all up and down the ports of the Western Territories. Our crew encountered their crew at the World Famous Empty Glass, and we ventured forth to bring ye a heap of video treasure from that fateful night. Above ye see an ARRRRR-F-C MINI SHOW starring the Dread Crew, in fine form. Down below ye see a bonus clip featuring the charming scoundrels, produced to mark this very holiday some five year ago. So, avast ye swabs, set sail for the music of The Dread Crew on this special day!